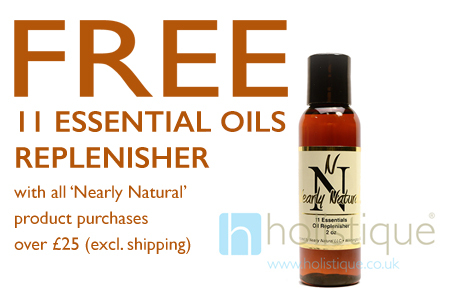 For a limited time only, when you spend over £25 on any ‘Nearly Natural’ hair care products on the Holistique website, we’ll give you the NEW Organic Hair Products Replenisher: ‘Nearly Natural 11 Essential Oils Replenisher’ absolutely FREE! The benefit of Organic Hair Products: This amazing product eliminates dryness and gets back the natural look and feel into your hair replacement system. 11 Essential Oils Replenisher from Nearly Natural contains eleven natural oils which penetrate, seal and moisturise your hair system, putting back its shine and leaving it looking great and feeling healthy. But HURRY – Only available whilst stocks last! Directions for use: Apply a small quarter size amount of oil in the palm of your hand. Rub hands together then run your hands through damp hair while allowing the oils to penetrate throughout your hair. Repeat as needed depending on the amount of hair required to cover. (For longer hair systems concentrate on the ends of the hair). After a light brushing of the hair: then style as usual. For deep conditioning : Apply oils after shower when hair is damp and allow to sit on the hair for 3-4 hours for maximum penetration. Then apply intensive moisturizing conditioner and rinse hair.